Taking action now can help forested watersheds prepare for and adapt to a changing climate. 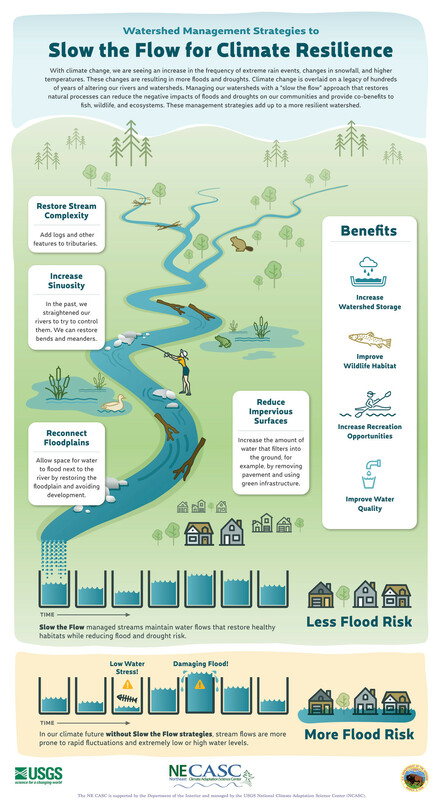 Forested watersheds improve water quality and enhance water storage, naturally regulate streamflows, reduce flood damages and stormwater runoff, replenish groundwater and provide a myriad of other benefits. Significant changes in temperature and precipitation present challenges to ensuring long-term ecosystem health, particularly in sensitive and unique riparian areas, and may amplify existing challenges related to infrastructure, stormwater, and water quality and quantity. Climate change will not affect all parts of a watershed in the same way. The local response and vulnerability of a watershed to regional climate changes will be influenced by soils, topography, forest management, and current and past land uses. Warmer temperatures and variable precipitation will have direct impacts on the water budget and the hydrology of forested watersheds; affecting the timing, distribution and seasonal availability of precipitation. Forest ecosystem vulnerability assessments can help managers characterize site vulnerability in forested watersheds. Understanding the potential interactions of climate changes on the physical, biological, and social environment is critical to ensuring natural resources management reflects future conditions. Adaptation is critical to sustaining forests and water resources that people, animals, and plants depend upon. We have expanded our work to include hydrologic themes relevant to ecosystem-based management. The forested watersheds menu of adaptation strategies and approaches was designed for managers working in forests, riparian areas, floodplains, forested wetlands, and lakesheds. The menu is helpful to managers who are interested in supporting hydrologic functions and accommodating hydrologic changes, including issues related to facilities and infrastructure. Download the publication "Adaptation strategies and approaches for forested watersheds"
Organizing and facilitating workshops and distance learning courses related to climate change impacts and ecosystem adaptation. Creating tools to aid adaptation of forested watersheds to climate change. Developing real-world examples of climate-informed forest management across a variety of land types and ownerships. What does forested watershed climate adaptation look like? Watch the video to see how forest management can improve forest and in-stream habitats to sustain water quality given extreme conditions. The Monongahela National Forest is decommissioning roads as part of a stream restoration effort to influence water infiltration, and water storage. The WICCI Plants and Natural Communities Group is partnering with NIACS to develop non-forested wetland strategy and approaches. Learn more about this effort. The Midwest Glacial Lakes Partnership is creating climate-informed tools for lakeshed and aquatic habitat management.